STATEN ISLAND, N.Y. -- Consider it a post-Christmas gift -- five times over. Jamie and Kevin Ferrante of Grant City became first-time parents yesterday at 1:30 a.m. when Mrs. Ferrante gave birth by Caesarean section to quintuplets in a matter of six minutes flat, according to Jamie's father, Tony Scherillo. In addition, the hospital where the babies were born, Staten Island University Hospital in Ocean Breeze, achieved a first as well: Its first-ever delivery of quintuplets. "They had to all be taken care of. They had teams of doctors and nurses with each baby," the 67-year-old grandfather said. "They must've had about 40 people in the operating room. It was amazing, and they were incredible. Absolutely incredible." The children -- in order of birth -- are: Allesia Louise, 2 pounds; Amanda Frances, 1 pound, 8 ounces; Emily Ann, 2 pounds, 1 ounce; Matthew Sabatino, 2 pounds, 4 1/2 ounces; and Ella Lilliana, 1 pound, 15 1/2 ounces. "Once I'd seen them in the neonatal nursery, that's when it was real, and it was like, 'Oh my God.' I don't know what I'm going to do when I get home," said the mother of five, Mrs. Ferrante, in a telephone interview. "Everybody was ecstatic. Nobody could believe it," responded Scherillo when asked about the family's initial reaction of learning his daughter would have five babies. While the chances of conceiving quintuplets are rare, the probability increases with use of fertility drugs. Mrs. Ferrante said she has used a fertility treatment. The federal government's National Center for Health Statistics tallied 68 quintuplet and higher-order births in 2005, compared to 418 quadruplets and more than 133,000 twins. "In the beginning, we thought we were having four, and then they found another one, so we kind of laughed it off," said Mrs. Ferrante, a co-manager at The Children's Place in New Dorp. "What's one more? We didn't really plan at all. It was just, 'OK, we're going to see where this takes us.'" Mrs. Ferrante was 27 weeks pregnant at the time of the births; she had been in the hospital's neonatal intensive care unit since Dec. 1. 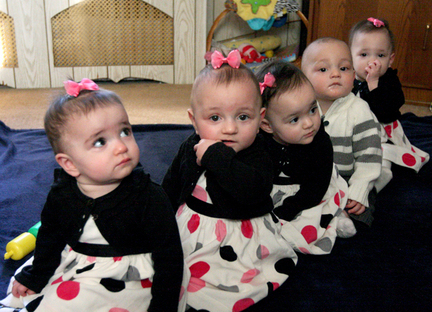 The quintuplets may come home in late February or early March, said Mrs. Ferrante. "I think it gives us more time to fix the house and everything at home first, before they come," she said. "I'll be here every day, and then, when they come home, we have a lot of family and friends really willing to help." Fortunately, she's already gotten some. Family and friends have supplied her with five cribs and car seats; however, she'll likely need a new family vehicle considering all five car seats won't fit in her Pontiac Bonneville. "You've got to be kidding," an excited Scherillo said. "I've got eight grandchildren ... and in 10 minutes, I've got 13 grandchildren. It's incredible. Now we need to try somehow to get them help. "We need to call the Pampers people, or Gerber food, or something. I love it." Mrs. Ferrante and her operating engineer husband should certainly hope so: The U.S. Department of Agriculture reported that the cost of raising a child by a middle-income family has increased 15 percent from 1960 to 2007. Compared to today's cost, $204,060, the cost to raise a child through age 17 in 1960 was $25,230. A Staten Island couple received a Christmas gift like no other - their own basketball team. Jamie and Kevin Ferrante became first-time parents five times over Saturday when she gave birth to quintuplets - four girls and one boy - at Staten Island University Hospital. "I'm still in shock even though I knew it was coming," Kevin Ferrante, 34, told the Daily News Saturday. The first bundle of joy arrived at 1:28 a.m. The four others were born within three astonishing minutes. "It was so quick I couldn't believe it," said Ferrante, an operating engineer. "Before it started, it was over. The team over there at Staten Island Hospital was unbelievable." The healthy children - delivered by Caesarean section - are: Allesia Louise, 2 pounds; Amanda Frances, 1 pound, 8 ounces; Emily Ann, 2 pounds, 1 ounce; Matthew Sabatino, 2 pounds, 4-1/2 ounces; and Ella Lilliana, 1 pound, 15-1/2 ounces. The quintuplet births was a first for the hospital. "I don't believe it," Jamie Ferrante said after she got to touch her tiny babies for the first time. The exhausted new mom - who received fertility shots and was 27 weeks pregnant at the time of the births - had been bedridden in the hospital's neonatal intensive care unit since Dec. 1. Her father, Tino Scherillo, could barely contain his emotions. "I had eight grandchildren yesterday; today I got 13," Scherillo, 67, said. "Last night was the most incredible thing I've seen in my life....It was amazing, and the babies are beautiful, just beautiful." Kevin Ferrante said that the couple had been expecting four babies until a second sonogram in August revealed a fifth. Doctors, he said, recommended reducing the amount. "We decided to leave it in God's hands and see what happens," Kevin Ferrante said. "No matter what, I think we made the right decision. It's something that a lot of doctors told us we wouldn't see." The couple lives in a compact, two-bedroom home in Grant City. "It's going to be tight," he quipped, adding that the couple's car, a Pontiac Bonneville, may need to be upgraded to fit the five new members of the family. The babies are expected to remain in the hospital until March. Financially, there is some good news for the Ferrantes: Since the babies were born before the new year, they will be able to file for five tax deductions. A Staten Island couple got exactly what they wanted for Christmas: five healthy, newborn babies. Kevin and Jamie Ferrante welcomed their new bundles of joy into the world yesterday at around 1:30 a.m. at Staten Island University Hospital - the medical center's first set of quintuplets. Amazingly, the four girls and a boy were delivered via cesarean section within six minutes, according to a hospital spokesman. All of the tots, who were born more than two months premature, are being closely monitored in incubators in the neo-natal ICU unit and will have to stay there for several more weeks. "I'll be here everyday, and then, when they are ready to come home, we have a lot of family and friends really willing to help," Jamie, 32, a manager at a children's clothing store, told the Staten Island Advance. Amanda Frances only weighs 1 pound, 8 ounces, while her brother, Matthew Sabatino, is the heaviest of the new family at 2 pounds 4? ounces. Sisters Allesia Louise, Ella LilliAna and Emily Ann fall in between. The Ferrantes were trying to have children for more than a year and a half and when they discovered in July that the fertility drugs were an overwhelming success. Their doctors weren't nearly as thrilled. "In the beginning, they recommended that we reduce the amount of babies, but we decided not to do that," Kevin said. "We left it in God's hands." But the worries of the high-risk pregnancy, which included Jamie being hospitalized since Dec. 1, turned to all smiles yesterday when they were able to see their children. "It feels really good because a lot of doctors said it wouldn't happen," said Kevin. "A lot of doctors wouldn't take us on as patients." STATEN ISLAND, N.Y. -- The Christmastime quintuplets that made a Grant City couple the proud parents of four daughters and a son almost didn't happen. "A lot of doctors told us we were doing the wrong thing," said new dad Kevin Ferrante, 34, whose wife, Jamie, gave birth to quintuplets Saturday with the aid of fertility drugs. Many doctors recommended the couple undergo "reduction" -- or abortion of one or more fetuses to improve the chances of the other. "I know I couldn't go to my deathbed knowing I did something like that, and neither could she. We figured we'd put it in God's hands, and so far so good." The five children born in six minutes at Staten Island Hospital, Ocean Breeze, were born about two months premature and all but one were on respirators in the hospital's neonatal intensive care unit yesterday. None of the children weigh more than three pounds, but doctors say that's a perfectly good weight under the circumstances. "They were born at a healthy weight for the risky birth that it was," said a SIUH spokesman, Christian Preston. "They [doctors] were comfortable with it." Meanwhile, the parents continued yesterday to count their blessings -- all five -- and marvel at the attention the birth has attracted from co-workers, regular Islanders, and the country. Big-hearted well-wishers called the Advance yesterday offering to donate cribs, baby clothes and other essentials, but the Ferrantes said thanks, they've got it covered. "It was a big deal for us, but I never thought it would be such a big deal for everyone else," said Kevin Ferrante, an operating engineer and native of New Dorp. "As much as you think the world is bad, it's been really nice with everyone calling us up." The couple has been trying to get pregnant for a little more than three years. About 1 1/2 years ago, Jamie Ferrante, 31, began receiving injections of fertility drugs. Her older brother, Danny Scherillo of Tottenville, remembers the phone call. "When she told me -- she was crying. She was just so thrilled," said Scherillo. "After all that trying and failing to get pregnant, it was great." The parents have not yet been able to hold their five new additions, but have been able to touch them. They were born by Caesarean section at about 1:30 a.m. Saturday, and all five were out in six minutes. They are, in order of birth: Allesia Louise, 2 pounds; Amanda Frances, 1 pound, 8 ounces; Emily Ann, 2 pounds, 1 ounce; Matthew Sabatino, 2 pounds, 4 1/2 ounces; and Ella Lilliana, 1 pound, 15 1/2 ounces. The smallest, Amanda Frances, was immediately placed on a respirator after the birth but had been taken off by yesterday, while her four siblings were placed on respirators, their father said. The couple had been expecting a big delivery, and thier mother had been at the hospital since Dec. 1 in anticipation of the birth. But even a day later, it still seems a little surreal. "Even though they're here and I knew they were coming, I still say, 'Oh, my God,'" Kevin Ferrante said. Now comes the really hard part: fitting Staten Island's new quintuplet cuties and all their gear into a two-bedroom ranch. Neighbors of Jamie and Kevin Ferrante - first-time parents who welcomed four girls and boy into the world early Saturday - stand ready to help. "If they need me, I'm there," said Albert Che, 22, who has offered to baby-sit. "Congratulations to them. It's great for them to finally have young kids running around the house." The preemies - delivered by Caesarean section during their 31-year-old mom's 27th week of pregnancy - are expected to be released from the hospital and move into the family's modest white home on North Railroad Ave. in Grant City in March. "It's amazing. We're going to have a lot of kids running around here," said neighbor Richie Caccese, a 51-year-old father of two. "I wish them well." Friends may need a cheat sheet to remember the names of the five new Ferrantes: Allesia Louise, Amanda Frances, Emily Ann, Matthew Sabatino and Ella Lilliana. Neighbor Ronnie Mahon, 21, said if anyone can handle quintuplets, it's the Ferrantes. "They're really good people," Mahon said. "If anyone can handle five kids, Kevin can. He's a hard worker." Some neighbors even admitted to feeling envious. "I wish I had quintuplets," said Hasan Saeed, 29, who became a proud papa himself on Friday. "All in one shot - you don't have to go to the hospital five times in five years. I think the whole thing is great." STATEN ISLAND, N.Y. -- They are already a media sensation, and they haven't even made their photographic debut. The tiny quintuplets born Saturday -- now cosseted in the neonatal intensive care unit at Staten Island University Hospital, assisted by tubes no bigger than stirring straws -- drew camera crews and other media from across the city and beyond yesterday, eager to hear more about the fantastic birth. Their mother, Jamie Ferrante, 31, looked more elated than exhausted as she was wheeled to the press conference at the Ocean Breeze hospital, and broke into tears describing the joy of being a mom of four girls and one little boy, all at once. "The delivery was amazing," she said in respect of the Caesarean section she underwent 27 and a half weeks into her pregnancy at 1:30 a.m. Saturday, a delivery orchestrated by a team of 49 physicians, nurses and specialists, who said they had practiced before the delivery to ensure everything went smoothly. "I didn't get to see them or hear them when they were coming out; they were whisked away so quickly," Mrs. Ferrante said. The siblings, who weighed between 1.8 and 2 pounds at birth, are doing well, doctors said. In fact, the smallest, Amanda Frances, was the first of the group to be taken off a respirator. "This is something you call ecstasy when you think about what hospitals stand for; we are all about life," said Anthony Ferreri, SIUH president and CEO. "This is the best event a hospital could have, the delivery of a child, and now we have five." Mrs. Ferrante, praised the care she is receiving at the hospital, where she has been since the beginning of the month, and said it is a bit odd no longer to feel the quints kicking inside her (and, yes, she could distinguish each baby moving separately). But it is a greater thrill to visit her children in the neonatal ICU several times a day and stroke their baby skin with her finger. She even got a little kick this morning from feisty Amanda, she said. "You look at their legs and they're like this," she said, pinching her fingers together. "They're so tiny." Now she is only longing for the day when she will be able to press them to her chest and embrace them --something doctors said will be possible when they no longer need medical assistance keeping their temperature steady and can feed independently. "I just can't wait for them to grow and get big and come home." she said, of Allesia Louise, Amanda Frances, Ella Lilliana, Emily Ann and Matthew Sabatino (all the middle names are for family members). If all continues to go well, that could be just a few months away, doctors said. The family, who plan to soon trade in their Chevy sedan for something that can fit five infant car seats, will be welcomed by a grand, extended family, who will surely be lending a hand -- or 10 -- to help with diaper changes and bottle time. "I'm going to be there every single day," said grandpa of 13 Tino Scherillo of Westerleigh. "It's wonderful we have so many grandchildren. It falls natural for us." Borough President James P. Molinaro, who attended the press conference along with City Councilman James Oddo (R-Mid Island/Brooklyn), quipped that with the Ferrante family around, it is easy to see why "Staten Island is the fastest-growing borough." But with only about 70 quintuplet and higher-order births a year in the country, according to the federal government's National Center for Health Statistics, these babies are something special. "Now we're going to have an even bigger family breakfast, said Mrs. Ferrante's sister, Traci Sabatino, who was cuddling her 7-month-old daughter on her hip as her 8-year-old son mugged for the TV cameras. "They're my angels, every one of them," marveled grandma Theresa Scherillo, in respect of her 13 grandchildren. "These babies; they're so small; but they're beautiful." Staten Island Jamie and Kevin Ferrante at press confrence at Staten Island University North Hospital on the birth of thier quintuplets. Forget about giving birth to five bundles of joy - try naming 'em. The Staten Island mom of quintuplets Monday said she and her husband had been told to expect three boys and two girls. The couple had to shift gears when she had four girls and just one boy. "I had a really hard time with the girls' names," said proud mom Jamie Ferrante. She and her husband, Kevin, settled on Allesia Louise, Amanda Frances, Emily Ann and Ella Lilliana for the girls and Matthew Sabatino for the boy. Kevin Ferrante said he was still "in shock a little bit" about their fast-expanding family. The new dad said he realized how much work the new quints are going to be when he heard himself talking on the radio. "I'm saying, 'Wow,'" he said. "If I would have been listening to this, I would have said, 'This poor guy.'" The five babies are all healthy, and one is already breathing on her own. They will spend about three months in the hospital, and doctors said they won't be sent home until they each weigh about 4 pounds. The couple underwent fertility treatments to help get pregnant, and things apparently went even better then planned. Doctors first believed Jamie Ferrante was pregnant with four children. Then, they determined that there was going to be one more mouth to feed. "I actually laughed," Jamie Ferrante said. "What's the difference between four and five?" Kevin Ferrante wasn't so calm. "He almost fell off the chair," Jamie recalled. Jamie and Kevin Ferrante, of Grant City, pose with their quintuplets at Staten Island University Hospital, Ocean Breeze. The first two of the quintuplets born to Staten Island parents Jamie and Kevin Ferrante at Staten Island University Hospital, Ocean Breeze, spent their first night at their Grant City home last night, after getting bundled up in pink and leaving the hospital at 5 p.m.
"It's amazing; it's real and it's here," said dad, Kevin, who caught a little sleep in between feeding Alessia -- who now weighs 4 pounds, 1 1/2 ounces -- and Emily -- who is 4 pounds, 3 and 1/2 ounces -- every three hours or so. "They're a little smaller, they're basically doing everything a regular baby does," he said about his girls. "It's a lot of sleeping for them." The first-ever experience yesterday of holding all five of the pint-sized newbies at the same time, came as a sweet shock. "It was like 'wow' you really feel it," he said. "I didn't know what that would be like. It really hit home." The five siblings were born Dec. 27. Matthew, the only boy, could come home by the end of the week, he said. "They just have to gain a little weight; they're all off the oxygen," said proud but exhausted dad, before heading out for the hospital for feeding, a routine he and his wife have been keeping for weeks. Two of Staten Island's miracle quintuplets spent their first full day at home yesterday waiting for their siblings to join them. Alessia and Emily, the first- and third-born to Jamie and Kevin Ferrante were released from Staten Island University Hospital late Wednesday afternoon. All five were born two months premature on Dec. 27. "It's really nice to have them home," their mom said yesterday. "The only little problem is that I have to keep going back to the hospital to see [the other three]. I don't want to not see them just because we have two at home. Ella, Emma and Matthew, the three of the Ferrante Five to remain hospitalized, are fighting routine weight and other health issues, doctors said. But Matthew may join the family's Grant City nest as early as tomorrow if he is recovering well from hernia surgery scheduled for today. "They tell me it's very common for premature boys," Jamie Ferrante said of her son's hernia. STATEN ISLAND, N.Y. -- Finally, Kevin and Jamie Ferrante have begun to use the dry erase board hung on the wall of their cozy, Grant City kitchen to keep track of baby feeding times. Alessia and Emily, weighing not even five pounds each, their mouths tinier than Cheerios, have been downing mother's milk every three hours since they arrived home from Staten Island University Hospital, Ocean Breeze, Wednesday evening -- and all their meals are lovingly noted on an elaborate graph in color-coded marker. Brother Matthew is expected to join them before next week, and if sisters Amanda and Ella make weight, the Island's quintuplets will all be home sweet home by the end of March. "It's amazing to see them here," marveled Mrs. Ferrante, who gave birth to the wee wonders Dec. 27, about three months before her due date. None tipped the scale at more than two pounds. "Wow; you're really growing," she cooed as she picked up and nuzzled dozing Alessia, who responded by grabbing her index finger with her delicate, baby hand. "You're a big girl; like a football player." Except for the occasional high-pitched mew Emily made as she shifted in her cradle, the girls napped without a peep, even as visitors gushed over them and mom and dad picked them up to pose for photos. Although five cribs are set up and waiting in the "kids' room" of their small, two-bedroom home, the Ferrantes slept on the couch in the living room next to the cradle where the two girls curled up for the night -- the closest they've been to each since the time they shared in the womb. "I was so nervous and excited last night, but now I'm getting used to it," said Mrs. Ferrante, who has been tirelessly pumping breast milk for her babies after doctors said it was the best possible source of nutrition, and still seemed more relaxed than many mothers of only one newborn. "They're a little smaller, they're basically doing everything a regular baby does," said dad Kevin. "It's amazing; it's real and it's here," he said, about embarking on their lives as parents of five. With Mrs. Ferrante having been laid off from her job as a retail manager just Monday of this week, it will require some serious budgeting to buy five of everything for the next 18 years, admitted Ferrante, who has hardly missed work as a union building maintenance man, even as he and his wife sprinted to the hospital for feedings several times a day. Key for them is the support of their large family, many of whom live nearby, he said. One sure-to-be-daily-visitor, grandma Theresa Scherillo, was sitting nearby, gazing at her napping granddaughters, swaddled in cheery receiving blankets. "They're so light, you don't even know you're holding them," she said. "I can't wait for all of them to get home." The priest was working overtime today. And no wonder: It was the christening renewal ceremony of Staten Island's celebrated quintuplets. Born to a happy Grant City couple, the four girls and one boy received their first sacrament today, seven months after their post-Christmas arrival. Kevin and Jamie Ferrante became the proud parents of the plus-sized brood on Dec. 27 at Staten Island University Hospital, Ocean Breeze, after three years of trying to start a family. The infants -- Allesia Louise, Amanda Frances, Emily Ann, Matthew Sabatino and Ella Lilliana, all born in six minutes -- were perfect angels as they submitted to the ministrations of the Rev. Joseph M. McLafferty, the pastor of St. Christopher's R.C. Church, Grant City, with the Ferrante clan and godparents looking on. They were originally baptized in the hospital shortly after being born. "They were all so good, they got their water with no problem," said Mrs. Ferrante. "Not just because they're mine, of course, but they're pretty much the perfect babies." The adorable quints almost weren't a fivesome. The parents were cautioned by doctor after doctor that having so many children was dangerous, and many urged that Mrs. Ferrante undergo a selective "reduction," to make room for the others. Kevin Ferrante admitted to being a little nervous when he became the instant father of five, but seven months later said the family is managing just fine -- with a lot of help. "Every time I go to work there's people there, when I come home there's more," said the operating engineer and New Dorp native. "My family got a lot bigger with everyone that comes to help." Everything else is as hectic as it is in the life of any new parents, he said, although "we do have to buy five of everything." After yesterday's christening, the family threw a balloon-festooned bash -- four pink and one blue at each table -- at the Staaten, West Brighton. The infants were "preemies" -- three months early -- and none weighed more than two pounds at birth. But by March all had gained enough weight to be released from the hospital, and yesterday they were as happy as could be. None of the babies cried during the christening, and neither did their parents -- although Kevin Ferrante admitted to feeling a tad emotional. "A little bit, of course, when you look down the whole row and see they're all yours," he said. The Ferrante quintuplets: Alesia, Amanda, Emily, Matthew and Ella. Allesia is the typical daddy's girl. Amanda, she's the toy thief. Emily's got patience. Matthew, a prince among princesses, is simply sweet. And Ella has a serious side. They make each other laugh. They make each other cry. Three of them can hold their own bottles; the other two aren't far behind. Together, they use at least 25 diapers a day -- up to 35 "when there's stuff in between" -- and six cases of formula. Grandma's laundry service is a 24/7 operation. The Ferrante quintuplets are growing fast: Next Sunday, they will celebrate their first birthday, two days after their first Christmas. "I just can't believe they're going to be a year old," said mom Jamie Ferrante as her fivesome played at her feet on the floor of their Grant City living room. "It's amazing how big they got," said dad Kevin, quietly watching his brood, a big smile on his face. A household that large runs on routine. The quints wake between 8 and 9 a.m. Eat breakfast. Play. Nap. Lunch is at 12:30. Then, they play some more. Dinner and a bottle is at 6:30. Followed by more playtime until 8:30. They have their last bottle at 10 p.m.
And mom ticks off the list like it's no big deal. "We came home with a schedule, but they made their own schedule," Mrs. Ferrante said. "That's what we go by now." A dry erase board in the kitchen tracks each quint and lists numbers for the pediatrician and the pharmacy. Clean bottles dry on top of the dishwasher and cases of formula are stacked in a chest in the kitchen. And six high chair seats are drilled into a wooden table. No, the Ferrantes are not planning another -- the seats were just sold in multiples of two. Playtime in the Ferrante house involves letting all five siblings loose on a blue blanket on the living room floor: On a recent visit, Amanda couldn't get enough of her shoes -- as in eating them -- and Ella was hanging out on her own while Matthew vied for a toy phone with Emily and Allesia. Coco, a labradoodle, and Spike, a miniature pinscher, made more noise than the quints did. "They're pretty good babies," Mrs. Ferrante said. "No," added their dad, "they're excellent babies." And every first is precious. "The biggest surprise is how I feel when they do something for the first time," Mrs. Ferrante said. "When one of them sits up for the first time or tries to say 'mama' or 'dada,' it has such a big effect on me." Mrs. Ferrante is a stay-at-home mom and dad works three nights a week and Saturdays and Sundays with the International Union of Operating Engineers, Local 94. They have in-home help every day, plus daily visits from grandma and Mrs. Ferrante's friends in the evenings. "Everyone said we'd never sleep again, we'd never see each other," Mrs. Ferrante said. "It's easier than we thought." They ensure they have alone time each week: On "Date Day Thursday," the couple shops for diapers and formula. "It's something," Mrs. Ferrante said. "We do go out to eat. We've got to get a break sometime." When the whole gang goes out together, it's quite a production. "We have a triple stroller and a double stroller," Mrs. Ferrante said. "You can't go out with just one person. You need accompaniment. In the mall, people stare and ask 'twins and triplets?'" "Yeah," Mrs. Ferrante answers them, "except I had them at the same time." Stephanie Slepian is a news reporter for the Advance. She may be reached at slepian@siadvance.com. 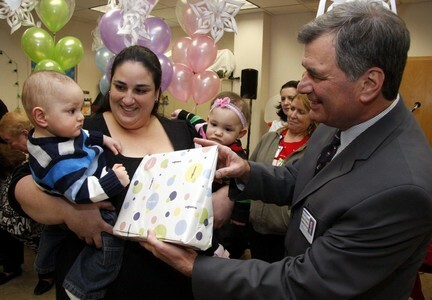 CEO of Staten Island University Hospital, gives a gift to Ella, one of the Ferrante quintuplets during a birthday celebration at the Ocean Breeze hospital. STATEN ISLAND, N.Y. -- In a year, they have gained 78 pounds among them, and have transformed from five tiny creatures, feeding through tubes in the neo-natal incubators at Staten Island University Hospital, to 1-year-olds with winning smiles and soft downy hair, who dazzle admirers with their baby charms and zest for life. The Ferrante Five -- as they have been dubbed -- born a year ago this Sunday at the Ocean Breeze hospital to Grant City mom Jamie and dad Kevin, returned today to the place which helped launch them into this world: Miracles of modern medicine whose progress over the past 12 months is equally a testament to their fantastic family. “If it weren’t for the hospital we would never have had these miracles,” said Jamie, wiping away tears, during a gala birthday celebration in the hospital’s pediatric rehabilitation room, where the babies were reunited for the first time with the dozens of hospital staff members who nurtured them during their first months of life. “You have been a family for the couple of months and will be for the rest of their lives,” said Kevin, to the hospital staff gathered. STATEN ISLAND, N.Y. -- In a year, they have gained 78 pounds among them, and have transformed from tiny creatures connected to tubes in neonatal incubators at Staten Island University Hospital to 1-year-olds with winning smiles and soft downy hair, who dazzle admirers with their baby charm and zest for life. The Ferrante Five -- as they have been dubbed -- Staten Island's first quintuplets, born a year ago this Sunday at the Ocean Breeze hospital to Grant City mom, Jamie, and dad, Kevin, returned yesterday to the place that helped launch them into this world. They are miracles of modern medicine whose progress over the past 12 months is equally a testament to their fantastic family. "If it weren't for the hospital, we would never have had these miracles," said Jamie, wiping away tears, during a gala birthday celebration in the hospital's pediatric rehabilitation room, where the babies were reunited for the first time with the dozens of hospital staff member who nurtured them during their first months of life. "You have been a family (to us) for the couple of months and will be for the rest of their lives," said Kevin to the hospital staff. As they spoke, the stars of the show looked on, sitting up and smiling in their matching, striped outfits -- pink-toned for girls Alessia, Amanda, Emily and Ella, and blue for Matthew. Their looks, in a word, cute; their behavior, in a word, angelic. "The greatest reward for all the hard work we do is seeing them here now," said Dr. Philip Roth, chairman of SIUH's pediatrics department, describing the team effort, resources and care involved in the babies' delivery and early weeks. Celebrating this milestone is a reminder of the sweetness in the mission of the hospital, which delivers about 3,000 babies a year, said Anthony Ferreri, SIUH president and CEO. "It was exciting when they were born and exciting when they came home," he said. "When you're celebrating a first birthday, this just makes us very happy." Deborah Young is a news reporter for the Advance. She may be reached at young@siadvance.com. At an obstetrician appointment in the spring of 2008, when Jamie Ferrante was 31 years old and six weeks pregnant, she was worried that she was having a second miscarriage. “But then my doctor told me, ‘This is quite the opposite. I see one, two, three, four heartbeats,’ ” says Jamie. Five weeks later, another doctor discovered a fifth heartbeat. Many women in Jamie’s shoes would have been a little frightened by the news, since caring for quintuplets certainly isn’t easy and because carrying multiple children has higher medical risks than carrying a single child, such as early labor and low birth weight. But Jamie wasn’t fazed. “I was so happy to be pregnant. I just thought, ‘OK, this is what I got,’ ” she says. Since Jamie had trouble getting pregnant naturally, she had undergone intrauterine insemination, which means that sperm were placed in her uterus around the time of ovulation. She also got injections to help her ovulate, which increased her chance for a multiple pregnancy. While she was pregnant, she felt a lot of pressure from doctors to reduce two or three babies. Sixteen weeks into her pregnancy, Jamie had to leave her job as co-manager of The Children’s Place to go on modified bed rest. At 23 weeks, she went to Staten Island University Hospital and stayed there until she delivered via a C-section. After 27 weeks and five days, on Dec. 27, 2008, Jamie was delighted to meet her five children for the first time: Alessia Louise (2 pounds), Amanda Frances (1 pound, 8 ounces), Emily Ann (2 pounds, 1 ounce), Matthew Sabatino (2 pounds, 4.5 ounces), and Ella Lilliana (1 pound, 15.5 ounces). Dr. Heltzer wasn’t the only one who impressed Jamie. The 40 hospital staffers who were assigned to help with the birth of her children also blew her mind. “They were all on call, just waiting for me to go into labor. Once I delivered, each baby had a team of six or seven people caring for it. The babies were labeled ‘A, B, C, D, and E’ and the team members wore shirts with corresponding letters on them. It was so cool,” says Jamie. The five babies were tiny and fragile right after birth. “Their skin was see-through. With one of my daughters, every time a doctor touched her skin, it bled,” says Jamie. There was a scare when Emily had a brain bleed, but, fortunately, it cleared up on its own. There was another moment of concern when doctors realized that Matthew was born without one pinky finger bone, so one of his pinkies was removed. As the children grew stronger, they were released from the Natal Intensive Care Unit one by one over several months. Life for Jamie and her husband Kevin, an operating engineer who was 34 at the time, became very regimented. “We stuck to a feeding schedule of 2:00, 5:00, 8:00 and 11:00, around the clock. And we were changing them constantly,” says Jamie. The norm was going through 40 diapers a day, 40 bottles a day, and seven cases of specialized formula a week. “I didn’t get much sleep at night, because I would stand over their cribs to make sure they were breathing,” says Jamie. As the kids got older, new challenges presented themselves. Just when Jamie and Kevin had mastered the baby routine, the kids started to crawl. “And when they started walking, that turned my world around. They were everywhere, all at the same time,” says Jamie. Sickness was — and still is — a hassle, because when one gets the flu, they all get the flu. Even when things are hard, she appreciates her good fortune. “I always remember that we beat the odds and I’m so grateful for that,” says Jamie. Another part of life that took some getting used to: being a local celebrity in Staten Island. Sometimes, it has its downsides. “Some people are rude,” says Jamie. “One lady at a mall once asked me, ‘Are they all normal?’ ” But for the most part, Jamie says the kind comments from people in her community are nice. “People will see me in 7-11 and say, ‘Oh, I saw your babies in the newspaper. They’re so big now,’ ” says Jamie. Now that the kids are in school, Jamie would like to work again. “After I dropped them off at kindergarten, I came home and started crying. The house was so quiet!” says Jamie. The Ferrante family was thrilled to celebrate the kids’ fifth birthdays this past December at a party hosted by Staten Island University Hospital with all the doctors and nurses who helped bring the children into the world. “It was so nice to see everyone who had taken such good care of my kids,” says Jamie. The hospital workers provided a dazzling, three-layer fondant cake that was decorated with snowflakes, gingerbread men, and snowmen. They gave the children Build-a-Bears, as well as Crayola backpacks filled with art supplies. The hospital staffers enjoyed seeing how much all five children had grown. “The fact that they all turned out so well is like hitting the Lotto. It’s definitely a reason to celebrate,” said Dr. James Ducy, director of obstetrics and maternal fetal medicine at the hospital. Lately, the kids have been on a kick where one will say to Jamie, “I need to hug you” or “I need to kiss you,” and then the others will immediately follow suit. Jane Bianchi was an editor at Seventeen, Family Circle, and Good Housekeeping, and now freelance writes for a variety of publications. She lives with her husband in Brooklyn. Come and see us on Wikipedia under the quintuplets section.